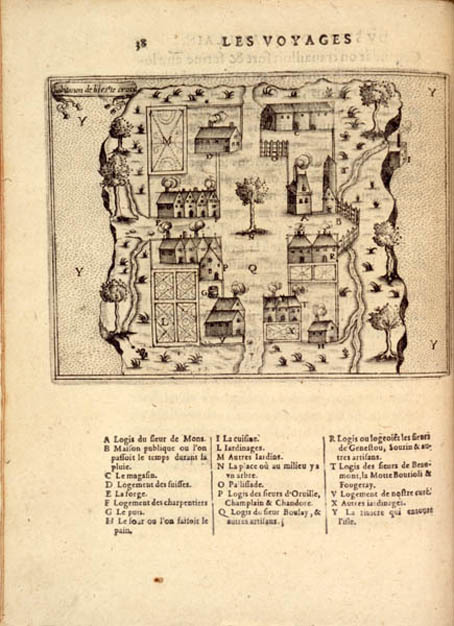 While in France, Champlain worked hard to solicit support for the colonial project in New France. Without the support of the king and investors, exploration and eventual settlement was next to impossible. The king needed to be convinced of the benefits to France’s sovereignty and economic interests, and the investors needed to be assured of profits and that subsidizing permanent settlements would result in greater financial benefits over the long term. Champlain and Pierre Du Gua, Sieur de Monts, who was appointed lieutenant-general for New France in 1603, worked together to build support for a colony in Acadia among investors and important figures at the French court. 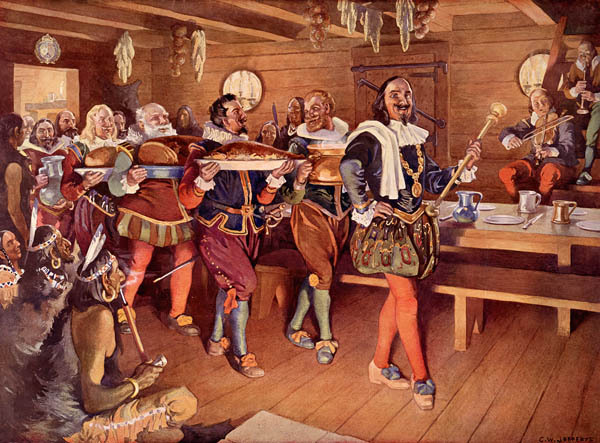 Sieur de Monts successfully raised the necessary capital for the voyage and invited Champlain to journey to Acadia with him early in 1604. They departed from France on April 7. A number of colonists accompanied them on their voyage, including nobleman Jean de Biencourt, Sieur de Poutrincourt, and numerous labourers who were usefully employed in exploration and the building of a colony at Acadia. Mathieu Da Costa, a translator of African descent, also joined the expedition and is believed to be the first Black person to arrive in Canada. Two Catholic priests and a Protestant pastor were also recruited to travel to Acadia. This reflected the king’s religious policy, which favoured Catholicism as the universal religion, but called for toleration of Protestantism and the common desire to spread religion among the Aboriginal peoples of the region. Champlain and his companions arrived at Acadia early in May 1604 and immediately began looking for an appropriate site for settlement. Champlain used his skills as a geographer and cartographer to examine, at close range, the Atlantic coast, the Bay of Fundy and the Annapolis Valley. It was eventually determined that the first settlement would be established on an island near the mouth of the Sainte-Croix River on the present-day border of New Brunswick and Maine. While this location seemed ideal for settlement in summer, by midwinter the following year things went terribly wrong. The broken ice on the Sainte-Croix River isolated the settlement from the mainland, and provisions proved inadequate for the cold and against the threat of malnutrition and disease. Many men died and, by spring 1605, few remaining settlers were in good health. 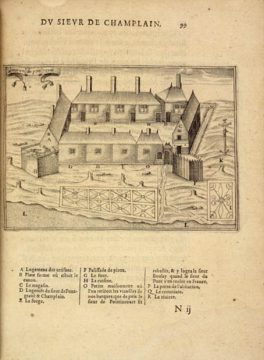 This first settlement at Acadia ended in disaster, but in spring 1605, Sieur de Monts chose another site for settlement and preparations were made to move from Sainte-Croix Island to Port Royal, near what is now the town of Annapolis Royal in Nova Scotia. Between 1605 and 1607, settlers worked to build a successful colony at Port Royal. 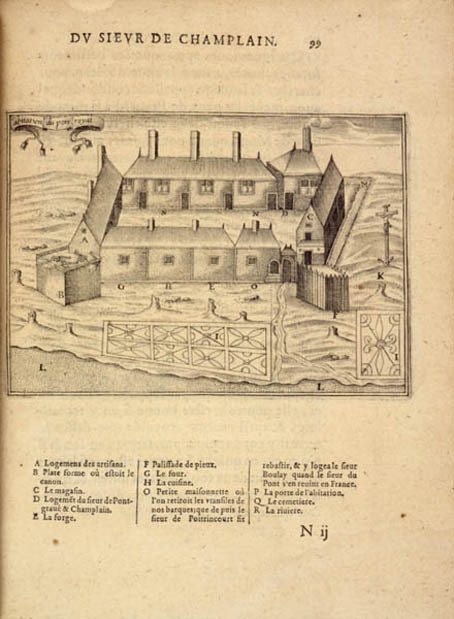 Numerous buildings were erected and several gardens created and, in July 1606, Sieur de Poutrincourt, governor of Port Royal, recruited 50 additional settlers to join the colony. Settlers at Port Royal were encouraged to labour collectively for the colony and individually for their own gain, resulting in a system of mixed enterprise that set Port Royal apart from other North American colonies of the period. Efforts were also made to establish good relations with the Aboriginal peoples living in the region. The Mi’kmaq in particular desired positive trade relations and an alliance against their enemies, and did much to assist the French with their colony. Champlain and his colleagues also had to find ways to sustain the colony through the harsh winter. There was much music and entertainment at Port Royal, and in the winter of 1606-07, Champlain established the Order of Good Cheer, which stipulated that each person who dined with Governor Poutrincourt had to take a turn feeding and entertaining the group once every two weeks. This initiative was highly successful and aided the colony in its winter survival, but also in its fostering of positive relations with Aboriginal peoples, a number of whom dined at Poutrincourt’s table. In May 1607, the Port Royal settlers received word of the failure of de Monts’s trade monopoly and were forced to abandon the colony and return to France. Despite its abandonment in 1607, Port Royal continued to play a role in French colonization efforts throughout the first half of the 17th century. Champlain, however, turned his efforts and attention back to the St. Lawrence Valley, to which he would return in the spring of 1608.